Based on the novel Conjure Wife by Fritz Leiber, Night of the Eagle follows the intriguing story of highly sceptical college professor (is there ever any other sort? ), Norman Taylor (Peter Wyngarde), who discovers his wife Tansy (Janet Blair) has been practising witchcraft to protect them both from his dangerously jealous colleagues. Norman is an uncompromisingly logical sort. 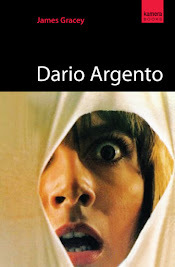 After his wife reveals to him that his colleagues’ wives are using black magic to ensure his untimely demise and she is countering their efforts by also dabbling in the occult, he fears she may be losing her mind. Tansy normalises witchcraft and speaks very matter-of-factly about it, even as she unpacks her groceries in one scene. She has hidden lots of little trinkets around the house to ward off evil forces, such as specially blessed spiders in little jars and various other bizarre accoutrements – Norman forces her to burn them and as she does, he accidentally burns a photo of himself too. Soon after he is almost killed in a traffic accident, accused of sexual molestation by a female student and held at gun point by said female student’s inconsolable boyfriend. Whereas Tansy cites these occurrences as evidence of the supernatural, Norman dismisses them as unfortunate coincidences. The stifling and suffocating little clique of academics and their spoiled wives that Norman and Tansy have been consumed by seem harmless enough to Norman. However Tansy seems to harbour a secret fear of one of the wives in particular, the disabled and gleaming-eyed Flora Carr (Margaret Johnston). They play bridge every Friday evening and it seems only Tansy senses the jealousy and hatred of the other women, who feel their husbands should have been promoted instead of Norman. All their little snide remarks and knowing glances whip up an atmosphere of tension and paranoia. As the Taylor’s are new in town, Tansy has no one to turn to except her scathingly sceptical husband who believes her to be naïve and susceptible to superstitious nonsense. Blair’s performance is suitably unhinged and desperate as Tansy finds herself becoming more and more isolated and afraid. 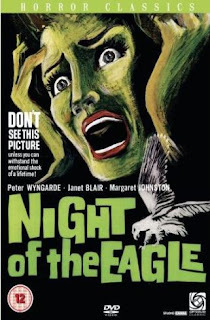 Taking elements from various MR James tales, Night of the Eagle also has distinct similarities to Jacques Tourneur’s Night of the Demon (1957), another subtly foreboding film in which a highly logical and sceptical man realises that the world is not as rational as he once thought and that the threat of the supernatural is a very real one. 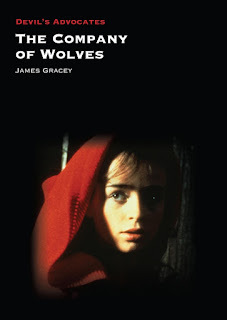 Indeed the first words of dialogue uttered in Night of the Eagle are ‘I do NOT believe’, and are spoken by Norman as he engages in a debate with his students about the nature of superstition. He claims superstitious people are entwined with a ‘morbid desire to escape the existence of reality’ and are dangerously close to insanity. Norman soon changes his mind (with this being a horror film and all) when his cosy world of reason and books is brutally ransacked by the chilly intrusion of witchcraft and the supernatural. When Tansy is possessed by the diabolical Flora, she retreats to their seaside cottage and Norman gives chase. A moody and frantic search on the cliffs for Tansy ensues as Norman becomes increasingly panicked. A number of shots of Tansy, as she gently lumbers along the deserted beach towards the eerily beckoning ocean, mirror similar images in another Tourneur film, his melancholically haunting masterpiece I Walked with a Zombie (1943). Tansy’s somnambulistic wanderings contrast nicely with Norman’s growing concern for her and the tension is wound ever tighter. A particularly bravura scene, again recalling Tourneur’s suggestive brand of horror and actually preceding a very similar scene in Robert Wise’s Lewton-esque The Haunting (1963), occurs when Norman receives a recording of one of his lectures in the post. He plays it and as he listens, a strangely hypnotic noise emanates from his audio-player and seems to cause momentary pandemonium. The Taylors’ house is suddenly set upon by an unseen force banging at the door while a storm bursts out of nowhere and rages outside. Tansy beseeches Norman not to answer the door as lights flicker and we are bombarded with sound effects and delirious camera work. Ambiguity soon gives way to the driving force of the narrative and gradual build up to an action packed finale. Any ambiguity is firmly quashed. We now know the interference of the supernatural is tangibly real. In another highly charged scene in which a crucial revelation is subtly revealed, Norman is menaced by a giant eagle in his classroom and staggers up against the blackboard where he had earlier scribbled ‘I do NOT believe.’ When he moves away from the board, his shoulder rubs off the word NOT, and the new message conveys the significant journey he has undertaken throughout the course of the film. He now firmly believes… Prior to this, Norman realises that his wife is possessed when she begins to limp towards him with murderous intent, mimicking the mannerisms of the disabled Flora Carr, who is revealed as the villain. 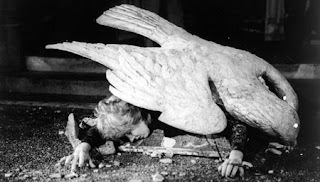 The films special effects are kept to a minimum but when onscreen, they are well handled – as evidenced in the scene where Norman is attacked by a giant eagle. We see only glimpses of its talons as the camera swoops and glides over Norman. Seeking momentary refuge in the school, the colossal bird soon pecks its way trough the huge oak doors and flaps wildly down the corridor after the terrified professor, cornering him in his study. 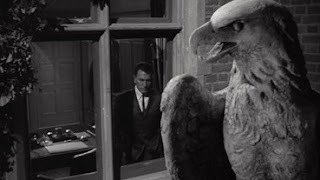 Indeed, aside from the scenes featuring the giant eagle, Night of the Eagle is a shining example of the Lewton-esque ‘less is more’ approach to horror. Wyngarde is mesmerising as Norman, whose icily cool and calm exterior gradually melting away into abject terror, is compelling to watch. 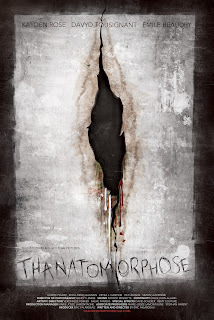 A subtle chiller that creeps icily under the skin.